Dogs are wonderful. They are family members and best friends, providing companionship and unconditional love. But dogs and people do not always speak the same language. It is important to educate yourself and your family about safety around dogs so you can recognize when a dog feels uncomfortable and does not want to the approached. Understanding dog body languge, polite behavior around dogs, and what to do when a strange dog approaches could be the difference between a good interaction and a bite. There are 70 million dogs in the United States, and 4.5 million people are bitten by dogs each year, according to the American Veterinary Medical Association. Children are the most likely to be bitten. 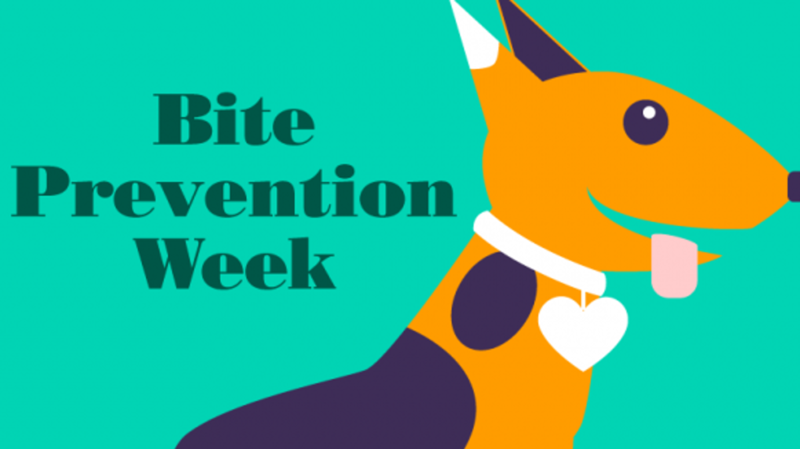 But most bites are preventable and this week is National Dog Bite Prevention Week – an opportunity to educate the public about safety around dogs. It is important to understand dog body language and know the warning signs that can lead to a bite. Rarely does a dog bite without warning; usually baring the teeth or growling occur directly before the bite. Always ask the owner before you pet a dog. Then allow the dog to approach you and sniff your closed hand. If the dog is friendly, you may pet the dog lightly (not heavy patting or thumping) on the back and/or shoulders. Most dogs do not like to be patted on top of the head. Don't stare directly into a dog's eyes and do not hover over the top of them. Stand slightly to the side and bend down so you are more on their level. Never approach an unattended dog. Do not reach over a fence or through a car window to pet a dog. If an unattended dog approaches you, whether he seems friendly or not, immediately “Be a Tree.” Do not run! Stop, fold your arms, and look at your feet. The dog will think you are uninteresting and move on. Stay in position until the dog moves on or someone comes to help. Do not yell, strike at, or make sudden movements toward a dog that has approached. This may cause the dog to react fearfully or aggressively in return. Never leave young children unattended with a dog, no matter how nice the dog seems or how well you know the dog. It is very important to teach children polite behavior around dogs. The way you raise your puppy has a significant impact on your dog’s future. Early positive socialization and training are keys to having a safe dog. Reward-based training helps your puppy learn to associate people, places and things as good, not a basis for fear or punishment. Supervised socialization with other puppies teaches bite inhibition and how to read other dogs’ body language. Take your puppy to training classes and teach them basic manners and obedience skills. If your older dog begins to exhibit behavioral changes, it may mean he is in physical discomfort. Consult your vet to rule out any medical causes. Educate yourself and your family about safety around dogs so you can recognize when a dog feels uncomfortable and does not want to the approached.